How many... seen "Rumours" tour ~??? If so, where did you see Fleetwood Mac ~ on the "Rumours" tour...??? I think that there are a couple of people on this board who had seen them on the Rumours tour. I know ChiliD for sure. I did see the Tusk Tour at Madison Square Garden In October of 1979. I saw them in Phiily in July of 1978.It was a great show. The highlight for me was they featured Sisters of the Moon from their upcoming new release. Well, my mom saw them in 1977 . Does that count? Wow..this is awesome!! A preview of SOTM? How cool is that?! I'd love to hear some more details about the tour from those who were actually there. I will do my best it was 31 years ago and I was a young buck at the time. It was an outdoor concert at JFK Stadium in Philly on July 31st 1978. Fleetwood Mac was the last act to go on.I know Bob Welsh was one of the performers and I was hoping Mick and John and Christine would join him for a couple of tunes but it didn't happen.I remember it was the first time I saw Lindsey with his short hair (shaved beard, stash, afro gone) The crowd was a bit taken back.They did Sisters of the Moon at the end of the show and the crowd went nuts.Rumours was so palyed out by the summer of '78 it was nice to hear something new.I have only missed one Fleetwood Mac tour since and that was the Tusk tour.My family was heading north for Thanksgiving and I didn't have much of a choice. 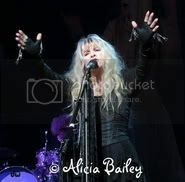 I have made all of Stevie's tours, Lindsey's last two, I have met Stevie in 1994, Mick in 1996 and have one heck of a collection of treasures from the years. I heard I Don't Want to Know on the radio in the spring of 1977 and that was it, I was hooked. I was there too and quite taken back by Lindsey's haircut. For a moment there I thought I was at the wrong concert. I thought he looked cool with the fro and beard, a real hippy, and was disappointed at first. But I enjoyed the concert and got excited about the new song. out for over a year!! I bought my first car to go down with my friends and enjoyed the day, though I seem to recall it was hot out there on the fifty yard line.. I wish I saw a Rumours show!!! My first Fleetwood Mac show was the Tusk tour. Last edited by Haunted_Song : 06-18-2009 at 01:27 PM. It was very hot....I was around the 50 yard line also.. Wow that's wild! That is wierd. We may even have bumped into each other!! Yeah, as Angel69 said, I saw 'em back then...I don't know exactly how many times, since the era from 1975-78 kind of all blended together...probably 30+ times in that era. To me, they never seemed to actually end one tour and begin another...they seemed to still be doing the occasional show here & there in midst of recording Rumours. I remember a show at the Universal Amphitheatre in June 1976 where they debuted "You Make Loving Fun"...plus, they'd been playing "Go Your Own Way" since November of 1975. I always liked when they'd toss in a "golden oldie"...like in May '76 when they played at UC Santa Barbara (where they filmed the outdoor live portions of the "Rosebud" video) and opened with "Sunny Side Of Heaven". Or, when they opened for Dave Mason at the Forum in late '75 and played "Rattlesnake Shake" as their closing song (yes, with Lindsey singing!) Or, in March 1977 when they dropped "Spare Me A Little" and played "Believe Me" instead...then shocked us all with Danny K's "Tell Me All The Things You Do" for the encore. All through that time, they still played "Station Man", "Oh Well", "Green Manalishi", & "Why", too. plus, they'd been playing "Go Your Own Way" since November of 1975. So, when Rumours came out, you already thoroughly knew the song, huh? That's pretty amazing. I saw them at UCLA at Pauley Pavilion in '77 & also at the UCSB stadium. Stevie cried & then laughed & then cried again during "Landslide" or one of the other songs, & some college students next to us said, "What's the matter with her?" My friend Jennifer Perkins took photos, & after graduating high school she went to the Eastman Kodak School of Photojournalism (?) & I think later took some photos for Life mag.